The drilling rig consists of propelling and supporting unit (drilling rig), power pack, operational panel. The colum can press against the tunnel roof tightly by the column cylinder, At the same time, the column bracket helps to improve the stability and safety during drilling. The propelling device fixed on the column locking sleeve crosses with the column. Multi stages cylinders inside the slide track drives the slide plate to run along the track. The cycloid motor driven by the high pressure oil drives the rotation of the drilling bit through the output shaft of the rotation unit. Mainly for the hole drilling of geological exploration, gas release, water or coal exploration, through hole, it can also be used as the bolter to drill the bolting hole. 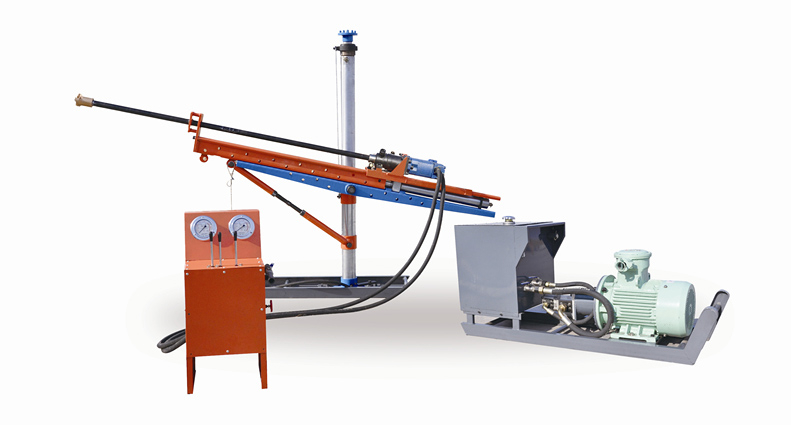 The whole machine can be disassembled to transport, reduce the labor intensity. The drilling bit can be alloy, PDC, it can be used in the coal mine and other mines. The drilling rig can be attached to the roadheader. Company's address: 167 Yuxiang Stret Shijiazhuang, China.